If there’s one downtown Sarasota Florida real estate development that can easily fire up the interest of condominium buyers, it would be the Burns Court Villas. 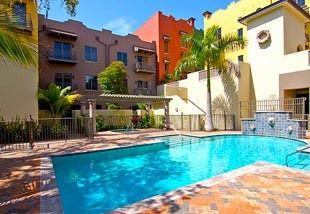 This community is conveniently located in the historic Burns Square section of downtown Sarasota. It is close to the numerous centers for arts and culture that have made Sarasota famous, as well as to the other urban attractions in the city. Burns Court can be found on the intersections of Oak Street and Selby Lane with South Palm Avenue. There are 23 residences in this development that was built in 2007. Inspired by Mediterranean-type villas of Tuscan architectural design, condos at Burns Court are a stand-out choice among all the Sarasota condos for sale. Typically, Burns Court Villas for sale are either two or three stories in design and are exquisitely constructed to give them a chic and elegant finish. Charming balconies, lush landscaping, garden walls, and quaint courtyard combine to give the Burns Court Villas the perfect home setting among the popular downtown Sarasota area. Burns Court Villas have floor plans ranging from 2,000 to 2,200 square feet with each residence designed for three bedrooms and two and a half bathrooms. The three-story units have elevators, and all homes feature stone and wooden floors, gas fireplaces, granite countertops, and ten-foot ceilings. Burns Court Villas for sale can be priced in the $500,000 to1.3 million range, certainly in the upscale range of the condo market. Villas for sale at Burns Court with a posted price in the mid-$500s will have floor spaces of about 2,000 square feet, three bedrooms, two bathrooms, and a two-car garage. Superb amenities are also bundled with the Burns Court residences. The community’s common facilities include an outdoor swimming pool and spa, and a social area with a stone fireplace. 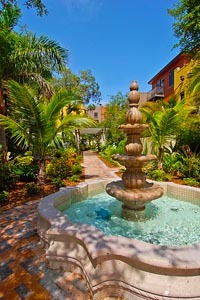 The charm of Burns Court Villas is enhanced by its classic landscaping featuring terraces, fountain and wall gardens. 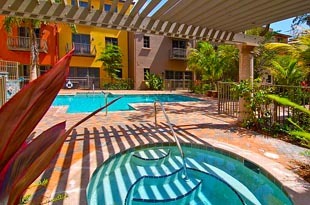 Nearby sources of recreation and entertainment for the residents are abundant. One of these is the Burns Court Cinemas adjacent to the community while a few blocks away is the Jazz Club of Sarasota. The Florida Studio Theater and the Van Wezel Hall of Performing Arts are likewise a few minutes’ drive from the condominium. The Marina Jack Trail and Bayfront Park are other points of interest that most condo buyers will appreciate. Besides the outdoor recreational opportunities in these areas, the Bayfront Park locality also hosts the O’Leary’s Tiki Bar and Grille, perfectly complementing the tropical Florida beach lifestyle. Shopping is likewise convenient for the condo residents as within their neighborhood are such establishments as Short Stop Market. The choices become even more diverse with a short trip either to St. Armands Circle or the Westfield Sarasota Square Mall, another two city landmarks that provide additional excitement to real estate buyers. Below are all of the current listings for villas for sale at Burns Court.